This post was brought to you by Volvo. Learn more here. Oh memories. There’s nothing quite like writing something like this where I get to walk down the path of the past and remind myself of what it was like the first time that I held any number of the devices about which I’m getting ready to write. 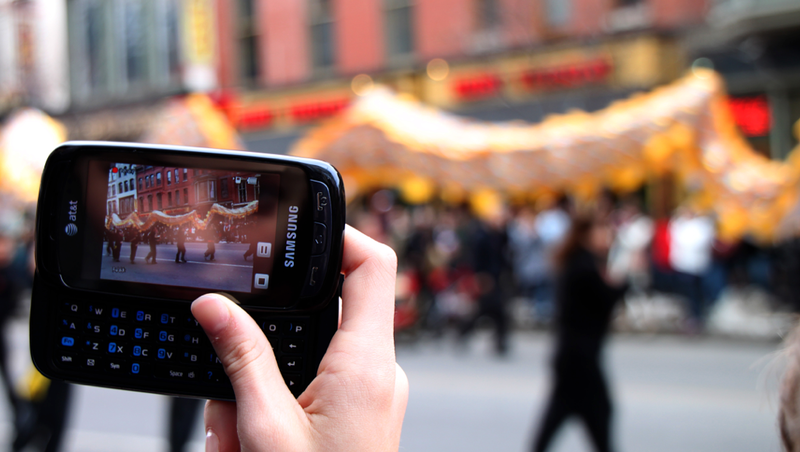 We’re talking about the history of smartphones, so sit back, grab a drink and let’s reminisce. Here’s where we have to start, because the line is blurry. Would the Sidekick be considered an early smartphone? Yes, by some people’s standards. But to others it was just a feature phone with a cool keyboard and a few other features. For the sake of argument, let’s say that a smartphone would need to have not only keyboard function (be that physical or on-screen), but also some basic “digital assistant” features, too. Taking that definition, we have to go all the way back to 1992 and the introduction of the IBM Simon. IMB had big plans for the Simon, but they never really panned out. The phone, however, was likely just too advanced for its day. It included a touchscreen, operated by stylus, that would let you send and receive fax messages. But it also of course had a notepad, an email client and a calendar. Without a doubt, the Simon was the first smartphone in history, but it would retire before gaining fame. Ericsson was the first brand to actually coin the phrase “smartphone”, with the release of its GS88 in 1997. By all accounts, though, Nokia actually beat Ericcson to the finish line a year earlier with what many consider to be the quintessential smartphone, the Nokia 9000 Communicator. I remember, in fact, watching promotional spots on TechTV in about 2001, where a later version of the Communicator (dubbed the 9500) was being advertised. It was the first of the Nokia smartphones to carry a color screen, setting it apart in the race. In the years that would follow, from 1996 to 2011, the Symbian OS would be the world’s leader for smartphone operating systems. Ericsson’s R380 was the first phone to ship with the OS, which (due in no small part to its open-source nature) would gain popularity around the world, only to be unseated by Android earlier this year. Fast forward to 2001 and we see Palm OS, BlackBerry OS and Windows CE coming onto the scene. 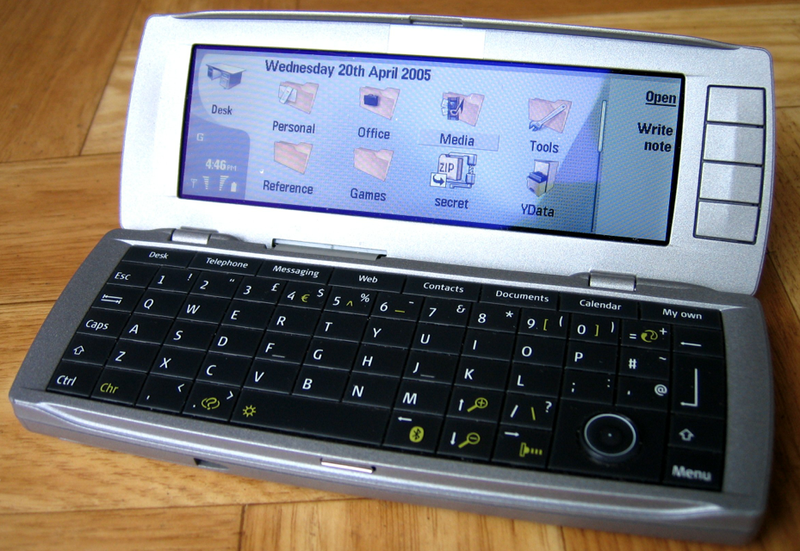 Palm had a respectable position in the market during this time, after releasing the Kyocera 6035, the basic form factor by which the rest of Palm’s line until the advent of WebOS would continue. 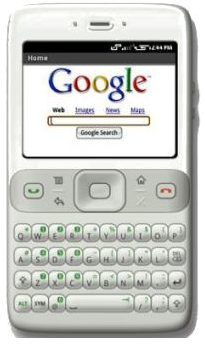 The design was so popular, in fact, that mobile manufacturer Handspring copied the idea for the release of its PalmOS-based Treo, a brand which would eventually become synonymous with Palm through the greater part of its life. Thus also began the era of choosing a phone depending upon the requirements of where you worked. Some IT departments refused to work with anything other than BlackBerry, setting up RIM to take a formidable hold over the corporate world for years to come. Still others, however, were fans of the Windows CE format, which interfaced exceptionally well with desktop Windows installations, though the glory would be short-lived. The fatal mistake for Windows-based mobile phones came in the fact that Microsoft offered two flavors. Windows CE was more of an “entry-level” OS, often separating itself from Windows Mobile by being offered on devices that were of lower capability. Windows Mobile, conversely, was modeled to look like something from the desktop version of the OS, and had the open door of allowing developers to create applications for the phones. Unfortunately, Windows Mobile never really took off as it was intended. As of 2010, it held the 5th position in the market and Microsoft has focused the Windows Mobile brand toward the enterprise. It might seem that we’re skipping a few years here, but that’s somewhat intentional. Devices changed pretty drastically between 2002 and today, but the operating systems were largely unaffected. That is, at least, until 2007. When Apple Inc. introduced the iPhone, it was the first real change that we saw in the market since the market was born. Smartphones had always been seen more along the lines of something that business people used, and Apple did a rather magnificent job translating the idea over to something that a consumer would desire. Initially, however, the iPhone and its platform were seen to be entirely too closed (an argument that persists today, but for different reasons) because it lacked the ability to have third-party applications installed. It wasn’t until six months later that the ability to add third-party apps was introduced. Quietly, however, another operating system was stretching its wings. Android, an open-source project which would eventually be backed by Google, made the promise of a reliable, robust operating system that could be installed onto any number of devices. In 2008, HTC signed up to be the first manufacturer to make Android phones after the backing of the project by Google. Soon after, the OS got considerable attention from other manufacturers, including Samsung, LG, Motorola and many more. The defining factor of success for smartphones, over the years, has been not only in their ability to run well, but also to give access to extended capabilities via third-party apps. Undoubtedly, Apple’s App Store carries the lion’s share of applications, but Google’s Android Market is growing quickly. To the detriment of almost every manufacturer, however, smartphones are also a breeding ground for frivolous lawsuits. From 2009 to today, in fact, there have been over 100 notable cases covering everything from multitouch gestures to 3G technologies. Interestingly, the name that has avoided much of this has been Microsoft. Or, at least its Windows Phone product. Windows Phone is the most recent of mobile operating systems, as of the time of this writing. Taking a completely different approach to its interface, it has managed to avoid the ire of Apple and Google, finding success on its own worth rather than copycatting others. One-time powerhouse Nokia is now manufacturing Windows Phones, having removed itself from the smartphone market otherwise. The first Nokia/Microsoft collaboration is the much-lauded Lumia 800, a device that TNW’s own Matthew Panzarino said could pull him away from his beloved iPhone. Both Apple’s iOS and Google’s Android boast high customer loyalty numbers, and pre-release sales of the Microsoft Lumia 800 would lead one to believe that it will enjoy the same. It’s been a long road to get us to where we are today, but the history of smartphones is an interesting journey. What does the future hold? You can be sure that The Next Web will be there, documenting every step along the way. What were the biggest phones of the history that we might have forgotten? Sound off in the comments.